Why do we not like Boros? In the past, I have called it “Bore-os” because a segment of my audience laughs audibly at puns and sends me messages like “You made coffee come out my nose” which I don’t believe for multiple reasons. The point is, dismissing Boros was as easy as making a dumb pun about the name of the guild - combat was a cinch but you struggled with things like mana ramp and card advantage and once being good at combat got boring, the decks felt clunky and inferior. Or whatever noise angels make when they’re piling out of a giant Angel helicarrier to Deus Ex Machina the Magicverse. Whether Feather yells “CACAWWW” when flying into battle isn’t relevant, at least not as relevant as how much card advantage we’re going to generate with this card. As excited as people are to have this commander and as hard at work as people are finding the perfect shell, I think the perfect shell already exists. Feather, after all, is a better commander for a deck currently being helmed by some wingless legends you may have heard of. Targeting creatures you control with spells is an old trick and we have a new dog to teach it to, that’s all. Anax and Cymede decks have been doing these shenanigans for years and lists of those decks can give us great examples of cards to look at for Feather decks. There is one caveat worth looking into, however, before we just plagiiarize an Anax decklist and put our name on it. Feather creates an exile trigger the replaces the “goes to the graveyard” portion of a spell’s resolution. You know what else does that? A flashback card cast from the graveyard. This means there are two competing effects on a spell if you cast a flashback spell from the graveyard and target a creature you control while Feather is in play. How do you reconcile those two replacement effects? Simple. You pick one. I recommend picking the one that puts the spell back in your hand. Say hello to the most relevant spell with flashback, in my view. Yowza. This doesn’t loop infinitely, but it DOES come back to your hand at the end of the turn if you cast it either from your hand or from exile. Creating an extra combat step for your whole team by targeting one creature? It sounds pretty enticing. How big is our whole team? Well, that’s something else I wanted to discuss, because I think you benefit a ton from having a wide array of tokens whether you have Anax and Cymede, Zada, Hedron Grinder, or Feather in play. Anax and Cymede have that pseudo team Prowess going on, Zada can spread the joy of a cantrip or a card like Temur Battle Rage far and wide and Feather can re-buy any minor cantrip until it’s an advantage engine, especially if that cantrip can keep Feather alive. What I’m saying is “This is the Assemble the Legion deck I’ve always wanted” and I’m pretty happy about it. Even 1/1 soldiers are formidable when you have two attack phases, they have double strike and Anax and Cymede makes them 3/3s. It’s obviously great when you have the spells you need, but how do we make sure we have the spells we need? I’M SO GLAD I’M PRETENDING YOU ASKED. Not only can we jam Assemble the Legion, here, but Sunforger is the perfect addition to the deck, buffing Feather to make sure we can deal 21 damage swiftly but also giving us access to a slew of helpful buffs from inside the deck at instant speed. With a few ideas about the base of the deck from Anax and Cymede and Zada, Hedron Grinder, some spells with Flashback to take a look at (and, I assume, Aftermath as well) and a potential Sunforger board, Feather is shaping up to be the commander that unites all of the Boros decks into one card advantage machine. Swingin’ like Aurelia, Slingin’ like Firesong and actually having a full grip for once - let’s see what a list looks like, shall we? 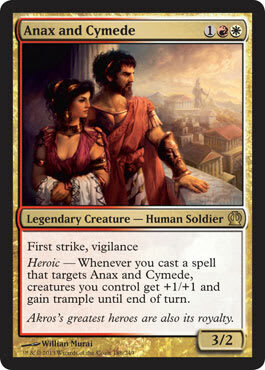 Reconciling Anax and Cymede, Zada, and Feather isn’t seamless, especially when you want to have a few Sunforger cards. There are some nonbos and some caveats, but you should have enough cards with access to Feather in the command zone to keep a full grip and draw into the halves of the synergy you are going for. I like making creature tokens so there are a ton here. A lot of the heroic creatures make tokens and we have Monastery Mentor and Young Pyromancer as well. Goblinslide is a fun addition and we have Assemble the Legion. Even a few of our creatures make more creatures. The Sunforger board has a lot of spells you can’t re-buy because you’re targeting their stuff and not yours, so just remember that you get one shot with some of those spells. Some of them, like Shelter, are a beating on the Forger because you get to keep casting them for value after. Want more cantrips? Cut something, but test it out first. Aurelia's Fury and Chandra's Ignition are pretty dirty with Feather, as is Fell the Mighty. Fury in particular may irk people since you can hit every player and Feather for 1 and keep them from playing non-creature spells every turn if you have x(x-1) mana where x is the number of players in the pod. They’re still able to cast creatures, and guess where they’re sending them? Be careful with that one. Feather has a lot more flexibility than Zada, so remember any creature of yours that gets targeted and you can re-buy the spell. This means spells that target two of your creatures are better with Feather than with Zada, so explore those a bit. 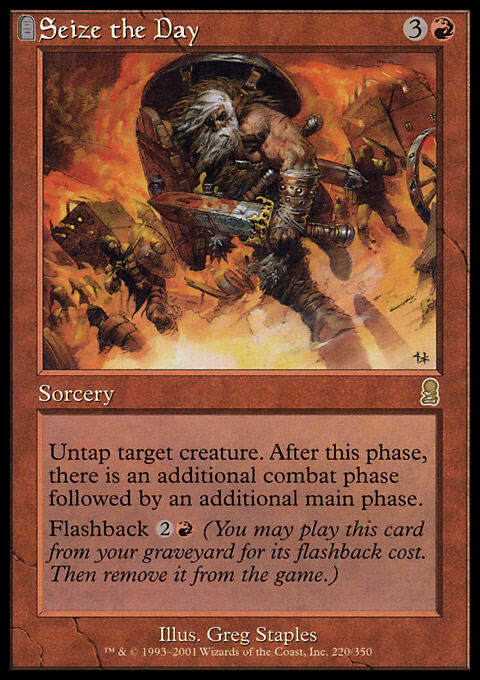 Anything that can Radiate out into your whole army without Zada’s help is useful, but Zada can make a Brute Force or similar spell really count, so try and save your Temur Battle Rage from getting countered so you can really go off when Zada is out. It’s way easier to draw anything else in your deck once you have Zada radiating cantrips than it is to draw Zada so keep that in mind. We’re not a Zada deck, we’re a Feather deck that can sometimes go nuts. What do we think? Is there a way to somehow recycle cards like Threaten to make this a real 75% deck? Would you add more cards like Lightning Helix, or would you be a combotastic deck and play Crimson Wisps? Leave me your ideas in the comments section below. 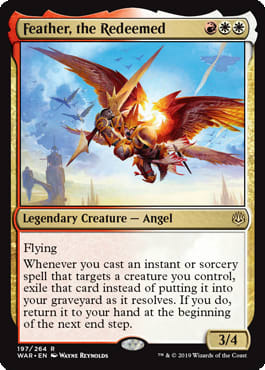 Feather is the most exciting Boros commander in a long time, so let’s brew something and maybe even jam so many cards we have to cut Aurelia's Fury and save ourselves the awkwardness. Until next time!